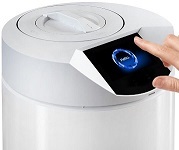 November 2017 - We are excited to offer you this new innovative tehcnology which allows you to run a quick media sterilization cycle for small batches of agar or media. The all new Mespresso microwave media preparator will do the job in minutes instead of hours and is perfect for specialty agar preparation or when you are in urgent need of a small quantity. You no longer have to wait for a full large sterilizer run or stand in line. At Neutec Group we are always thinking about your work flow productivity. Finally there is a quick fix!